Note: Utility-scale generators are one megawatt or greater. Installed capacity includes utility-scale solar PV plants owned by independent power producers. North Carolina surpassed states with more favorable solar resources to become the state with the second-highest amount of installed utility-scale solar photovoltaic (PV) capacity owned by independent power producers in 2015, behind only California. Utility-scale—one megawatt (MW) or greater—solar PV growth in North Carolina has been encouraged by a decades-old federal mandate, the Public Utility Regulatory Policies Act of 1978 (PURPA), and by state policies such as the renewable portfolio standard and the state renewable energy tax credit. 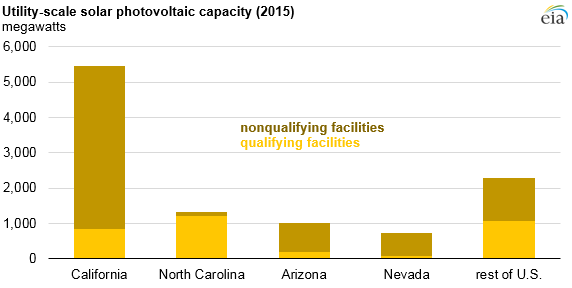 Currently, 1,173 MW, or 92%, of North Carolina's 1,271 MW utility-scale PV capacity is certified to have qualifying facility (QF) small power producer status under PURPA, which is more than any state in both absolute and percentage terms. Congress passed PURPA in 1978 to promote alternative energy resources and energy efficiency, as well as to diversify the electric power industry. PURPA requires utilities to purchase power generated by qualifying facilities at the rate of the utility's avoided cost. Avoided cost is the cost a utility would incur if it chose to either provide the energy itself (by building new capacity) or to purchase the energy from nonqualifying facilities. Although PURPA is a federal mandate, individual states were left to set specifics such as the avoided cost calculation and the minimum capacity threshold. For North Carolina, utilities are required to establish up to 15-year fixed-avoided cost contracts for eligible solar PV qualifying facilities (QF) with a contract capacity of up to 5 MW. The availability of long-term contracts helps solar PV developers secure project financing. North Carolina's approach contrasts with the approaches of other states such as Arizona or Nevada, where the utilities offer contracts with shorter contract terms or with lower capacity thresholds. Furthermore, the recent build-out of PV in North Carolina indicates that the avoided cost rates in that state, in addition to state and federal incentives, are attractive to PV developers. Note: PURPA is the Public Utilities Regulatory Policies Act of 1978. Installed renewable capacity includes utility-scale plants owned by independent power producers. 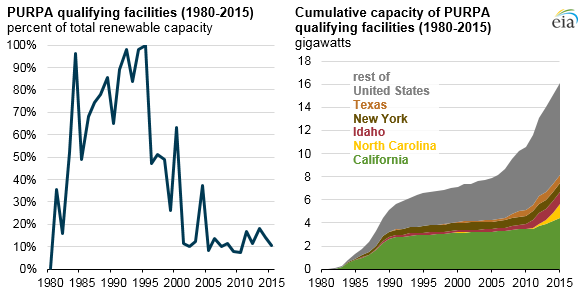 Renewable electric generation capacity by independent power producers grew for most of the 1980s and early 1990s, largely as a result of California's implementation of PURPA. PURPA's influence decreased in the 1990s when fuel prices declined, which lessened the competitiveness of renewable energy compared with other fuel sources. Around the same time, many states revised their PURPA rules, which reduced the required avoided-cost rate and contract length. The Energy Policy Act of 2005 allowed states with competitive electricity markets to opt out of PURPA, lessening PURPA's impact in states participating in regional transmission organizations (RTOs), but keeping PURPA relevant in areas such as the Southeast and Northwest that do not have RTOs. Although PURPA implementation in states such as Arizona and Nevada is not as favorable to PV as it is in North Carolina, these states have (or have had) other state-level programs that, when combined with their favorable solar resources, have encouraged significant utility-scale solar PV development.